Discover How a Real Estate IRA Can Help You Grow Your Business! Tap into the $7.5+ trillion market! Smart real estate professionals understand the advantages of self-directed retirement plans. 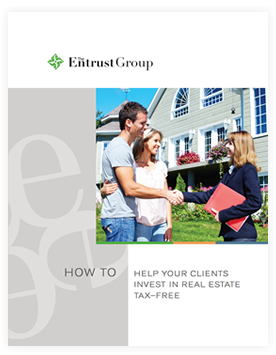 Download our guide on how real estate transactions work in IRAs and how they can help you grow your real estate business! Our goal is to complement, not compete! In addition to helping investors, we provide educational resources to real estate professionals. The Entrust Group is well positioned to help you comply with recent changes in federal regulations related to alternative investments through online Continuing Education Courses,White Papers, and more. [...] Because of Entrust, I purchased a great house with my IRA and I am receiving monthly payments equaling about 9 percent return. Entrust has made my future more stable and predictable. Thanks Entrust.